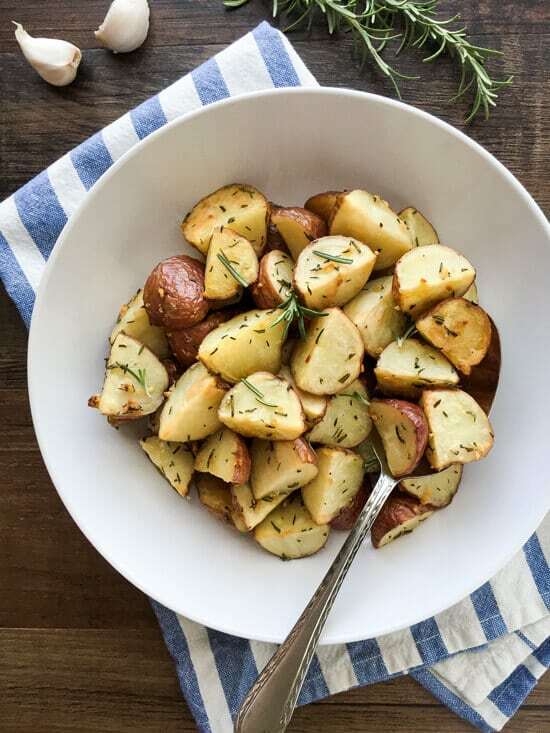 Simply seasoned with garlic, rosemary and thyme, these Roasted Baby Red Potatoes are a delicious and easy side dish. Great with steak or chicken for a hearty and scrumptious meal! Is there any other side dish that is as tasty and comforting as roasted potatoes? Pretty sure there isn’t. I made these Roasted Baby Red Potatoes last year for Thanksgiving. Last year, my husband and I stayed home and had a Thanksgiving dinner for two. The weather was just plain miserable that week. I remember that it rained like crazy that whole weekend. I’m talking, should we start building a boat-type of crazy. We got between 8-9 inches of rain that weekend. That whole year was pretty much just rain, rain, rain. Anyway, when it’s just the two of us or we have a couple of guests, we don’t need large amounts of side dishes for Thanksgiving. And, I want something really simple to prepare to go with whatever else I’m cooking. I tend to make pot roast. It’s one of my husband’s favorite dishes, and I love the fact that it can be cooking away in the crockpot while I do other things. Shortly before the pot roast was done, I popped these potatoes in the oven. About thirty-five minutes later, we had delicious oven roasted red potatoes to go with our pot roast. Such a great and simple side dish! Of course, you don’t have to just save these for a special occasion. They make a tasty side dish any time of year! Another delicious and really simple side dish that would be great for a Thanksgiving for two meal is my Super Tender Green Beans with Butter and Garlic. 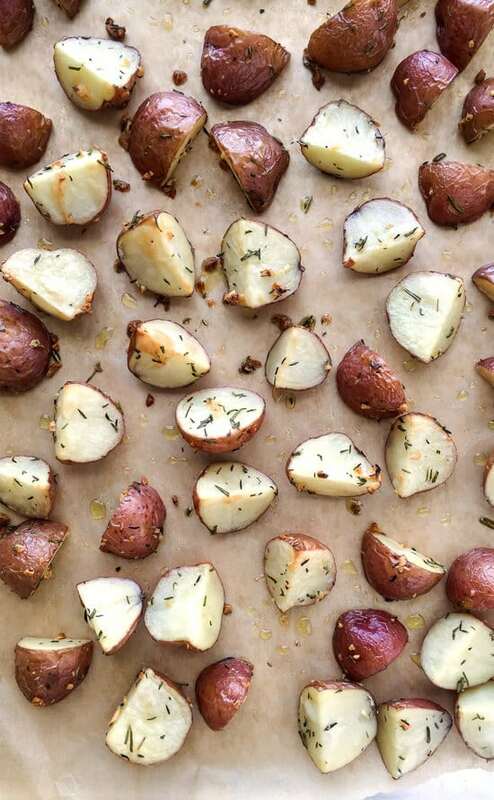 Simply seasoned with garlic, rosemary and thyme, these Roasted Baby Red Potatoes make a great side dish for steak, pot roast or chicken! 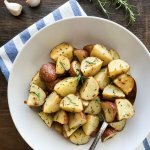 In a large bowl, toss the potatoes with the fresh herbs, olive oil and garlic. Place a sheet of parchment paper onto a sheet pan, and spread the potato mixture out onto it. Season with salt and pepper and place into the preheated oven. Roast the potatoes, tossing them once halfway through the cook time, until the potatoes are tender inside and golden brown and crispy on the outside, about 30-35 minutes.